Melt dark chocolate either in the microwave or a double boiler. Line a baking sheet with parchment paper and pour chocolate on. You can smooth it with a spatula to the thickness you desire. Stick in the freeze for 20 minutes. Melt while chocolate. Whisk in cake mix slowly, stirring well until no lumps remain. Let it set for 3 full minutes (or at least until it slightly thickens). 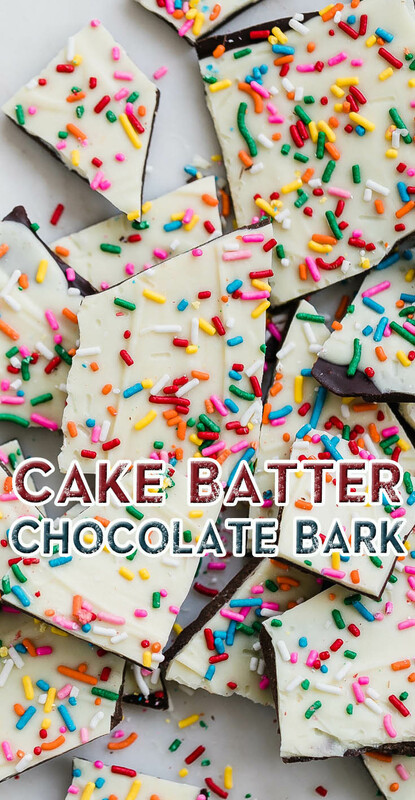 Remove baking sheet with chocolate from the freezer and immediately pour white chocolate on top. Sprinkle on sprinkles. Freeze for 20 minutes.